Certain fungi are not so much rare as overlooked. 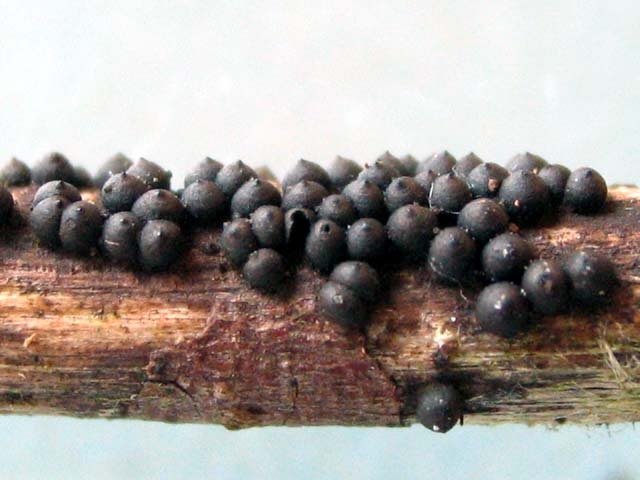 How many people have gazed upon Sarea resinae, for example? 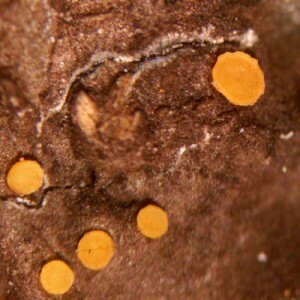 This orangeish ascomycete, seldom more than half a millimeter in diameter, makes its home exclusively in conifer resin. Then there’s Coltriciella dependens, the Wasp’s Nest Polypore (see my book Fascinating Fungi of New England for a description), which typically fruits on the inside rather than the outside of a log. I dare say few fungophiles — or anyone else — go about prying open logs in search of this species, which does indeed look like a wasp’s nest, albeit an upside down one. Alas, I can imagine a day in the not too distant future when Bridgeoporus nobilissimus — a species whose fruiting body is sometimes five feet wide — might be overlooked, assuming it doesn’t go extinct first (its substrate, the Noble Fir, is much in demand as a Christmas tree). You might wonder how such a giant fungus could be overlooked. A person could just as easily not see an elephant, a giraffe, or a charging rhino. Precisely. For we live in the first era in human history where a sense of the umwelt — defined by that source of all knowledge, Wikipedia, as “surrounding world” — has all but disappeared. Go out onto the street, and you’ll immediately see what I’m talking about. Most of the population will be moving about in what might be called the iDevice Saunter whilst engaged in a colloquy with another saunterer somewhere else. Anyone who isn’t moving about in this mincing, halting, self-absorbed pace, punctuated by sidesteps, runs the risk of smashing into the saunterer… or mimicking the progress of a Galapagos tortoise. If I wanted to be unkind, I could refer to such individuals as digitally-fixated zombies hypnotized by the diminutive screens somehow glued to their hands. But I don’t want to be unkind. Quite the contrary. I would like to help these aforementioned individuals. I want them to be aware of the sights, smells, and sounds of the natural world. Maybe even notice a mushroom or two. Plus, I’m worried that their obsession with their iDevices is putting their lives at risk. A tornado or tsunami could be approaching them, and they wouldn’t know it until it was too late. Or a real Android, as opposed to the digital sort, could be getting ready to grab them, and they would be absorbed in Kevin’s latest posting on Farcebook, er, Facebook that the Android would make mincemeat (or whatever Androids do with their victims) of them. As for myself, I’m just content to wander about in search of odd organisms in our increasingly diminished natural world. I don’t own an iPhone, iPod, Android, Blackberry, or Bluetooth. 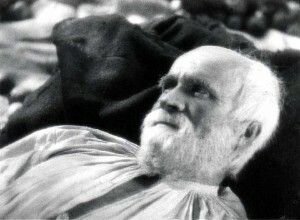 But I do own two reasonably good eyes and a pair of legs, which, to me, is quite enough. After all, I used both of them to find a Sarea resinae a week or so ago. My thanks to Jason Hollinger for kind permission to use his photograph of S. resinae.